Japanese filmmaker Hayao Miyazaki has always kept a close tether to the world around him. In wonderfully thoughtful films like My Neighbor Totoro and Pom Poko, beloved by young and old (and crowds and critics) alike, he has eagerly yet tenderly explored our human connection and disconnect with our wider natural habitat. The often hidden worlds around us may be too often overlooked, but in Miyazaki’s worlds, as in our own, they can never be truly separate from us without inviting disaster. That elemental pull that courses through so much of his cinematic universe is present again in Ponyo, Miyazaki’s 2008 animated take on Hans Christian Andersen’s classic fairy tale The Little Mermaid. 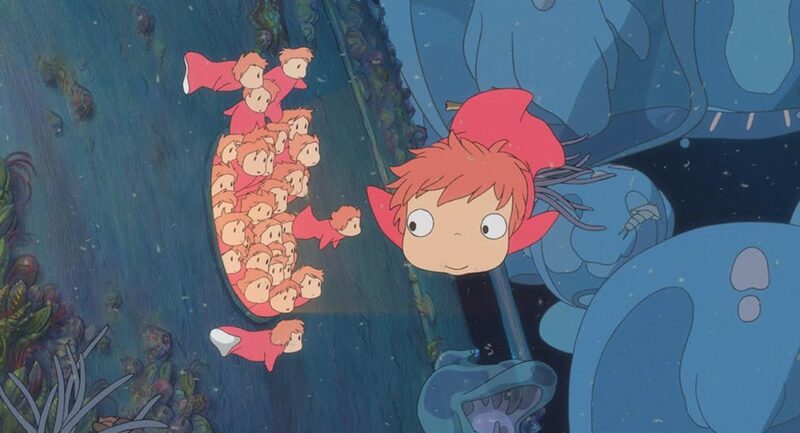 In his version, Ponyo is a goldfish rescued by the young Sosuke, who lives in a house overlooking the sea. 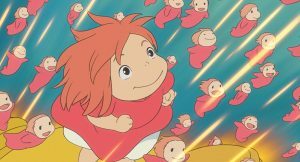 When he finds Ponyo, she has escaped a tightly controlled life with her father Fujimoto, a caretaker of the ocean whose style appears heavily influenced by glam-era Bowie. Despite (or because of) his claim that he was once human himself, Fujimoto has come to despise humankind and all that their neglect has done to his kingdom, and vows to keep Ponyo sheltered from their ruinous influence. 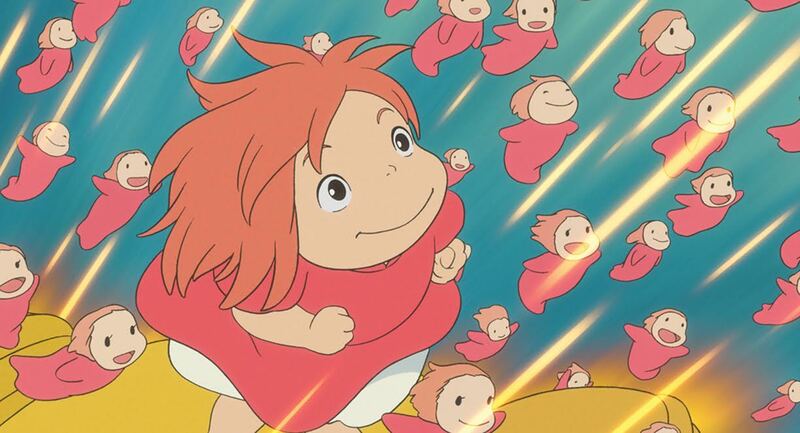 Ponyo, however, sees the hope and purity still present in humans — at least in some of the younger ones. Defying her father and determined to reunite with Sosuke as a human, her escape from the sea triggers a cataclysm. 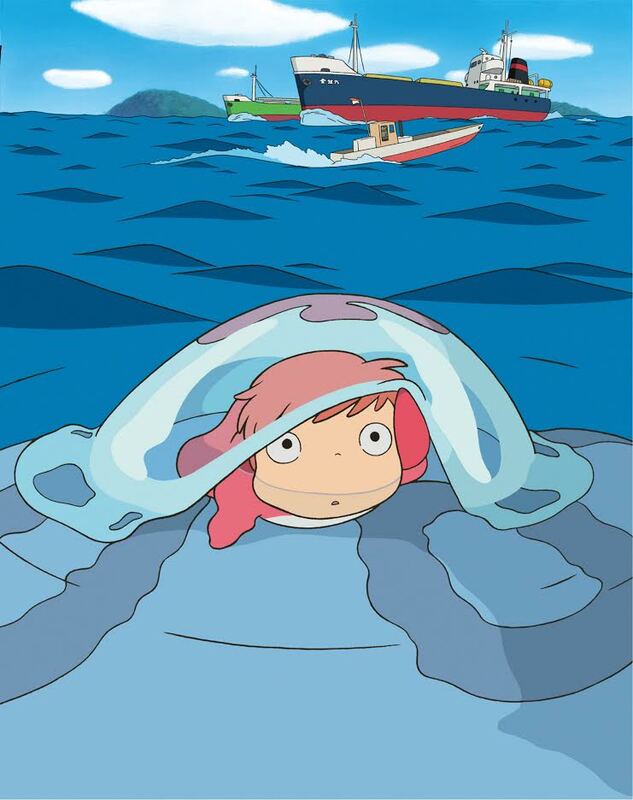 Tsunamis threaten ships and shore, the Moon is pulled ever closer to Earth, and Ponyo’s glee in her newfound (human) freedom threatens to harm those she loves most, both in and out of the water. If that sounds burdensome, Ponyo (and Miyazaki) never scolds. Instead, it reminds us that we are all better off when we share a devotion to making the world a better place, and not by walling ourselves off, but by working together. While Ponyo screens as part of Amherst’s Family Films series, another animated Japanese classic finds a home in the cinema’s Late Nights lineup. The R-rated 1988 landmark Akira, directed by Katsuhiro Otomo and based on his own manga, is an electric science-fiction futurama that gets underway by destroying Tokyo and kicking off World War III. By 2019, the war has ended and harmony has been somewhat restored — Neo-Tokyo has been built, but is beset with violence and corruption. The roving motorcycle gangs that criss-cross the city include young Tetsuo Shima, who is involved in a crash with a mysterious “esper,” or someone with psionic powers. The accident awakens previously dormant psychic powers in Tetsuo, who is soon identified as someone whose power is similar to that of the esper Akira, who was responsible for the detonation of old Tokyo. As the army and the resistance fight a street war, Tetsuo struggles — sometimes with violent results — to control his rapidly growing abilities. Now that we have reached the date of the film’s setting, it’s a good a time as any to revisit the spectacle of Akira, which set off its own sea change back in the eighties. It’s fair to say that (for Western audiences, at least) much of our interaction with Japanese cultural imports over the last three decades owes something to Otomo’s remarkable vision.